If you are interested in purchasing a publication you can email for details here. To read an article about Survival Legacies and other projects, published in The Canberra Time’s Panorama July 30th 2011, click here. Stories of survival and adaptation provide a rare glimpse into what it has meant to be Aboriginal in the urbanised southeastern part of Australia. These accounts, presented in an historical framework, are drawn from Aboriginal elders, mothers, stockmen, storytellers, politicians, tour guides, law-breakers and law-makers. 600 pages, 170 photos, 200 illustrations. Leeton has a lively history which celebrates the achievements of its community. Leeton’s heritage is traced across a wide range of themes: Aboriginal camp; cannery; Women’s Land Army; Art Deco buildings; Henry Lawson’s life in Leeton. The town reached a peak during the 1920s-30s irrigation boom. At that time, Leeton’s growth overtook that of its two beautiful, sleepy villages, Whitton and Yanco. 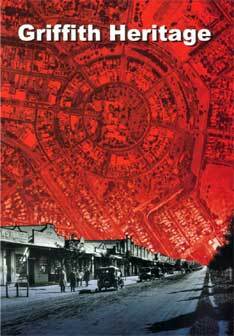 The story tells how Leeton acquired the beauty of an early 20th century town, heavily influenced by Griffin’s town plan. 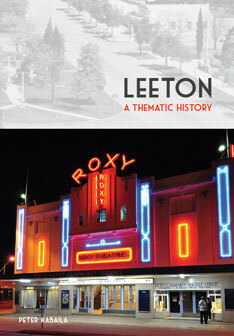 It recognises Leeton’s many historical icons, such as the Roxy Theatre, Henry Lawson’s cottage, War Memorial, Chelmsford Place, Whitton Historical Museum, Yanco Powerhouse, Sir Samuel McCaughey’s mansion, and over 26 notable structures of the Art Deco style in Leeton. The stories in this book are part of a wide canvas of Aboriginal and non-Aboriginal people affected by past practices of removal and separation from families, including by adoption, foster care and out of home care. Stories also allow people to unburden themselves of secrecy, and to begin to reclaim their dignity by challenging the shame and blame associated with removal from family. Women were affected by the experiences of removal and institutional treatment and this book shows how many of them not only survived, but transformed their own lives by their courage and perseverance. 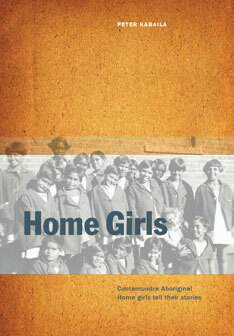 To mark the centenary of the Cootamundra Home, this book provides a lively written history to celebrate the survival and achievements of the Home girls. Griffith is the fascinating city in western New South Wales that became famous for its irrigation framing, Italian culture, drug scandal and wineries. This book traces Griffith’s heritage from its earliest inhabitants, through the era of pastoral settlement, to irrigation and the agricultural and commercial pursuits of today. In Griffith Heritage, local people tell their own stories of Griffith’s progress from the mayhem days of “Bagtown”, the early 20th century construction camp, to a thriving, stable, multi-cultural and prosperous community. A separate section of the book provides a useful “how-to-do-it” example of a community based heritage study. Local people, helped by a co-coordinator, contributed many hours of work and research, to identify places of heritage significance in Griffith. The heritage study, thematic history and recommendations that were presented to Griffith City Council are summarized in this section. 220 pages incl. illustrations and maps. Bibliography. Includes Index. Project: Location Survey of Belconnen’s Aboriginal sites. For the first time in Australia, this book reads the faint archaeological signatures in a suburban landscape to create an imaginative reconstruction of life before European settlement. It uses archaeological surface survey as a springboard, reconstructing Aboriginal lines of travel, band ranges and special purpose sites. By weaving various strands, such as early European journals and recent archaeology, the author has recreated a fleeting but authentic portrait of our vanished Aborigines. Belconnen has some 80,000 residents today, but before whites came, the Aborigines are believed to have numbered 10 to 20. Traces of their life are not many. There are no obvious middens, fish traps or cave paintings in Belconnen. The main evidence is a number of austere stone scatters, flakes and cores, trimmed blades and grindstones being rare. But these finds, when related to the topography and type of vegetation, can be used to infer both fixed sites (for example, near water sources, defensive spots or dry camping grounds) and the pathways that once intersected Belconnen. Early witnesses to Aboriginal life include Louisa Meredith, Wright, Bluett and Samuel Shumack. They were careful and generally sympathetic observers, and the long first chapter, which relates these diaries to the landscape, is perhaps the most moving. It is enhanced by some profiles of local Aboriginal people. We are given clear definitions of terms like site and artefact, and the recording methods used are well described. So too is the five-stage cultural sequence of stone tool technology, and the changing nature of archaeology itself, especially “commercial archaeology”. From our house in Higgins, Belconnen, we can sometimes hear the sheep calling from the paddocks across Drake Brockman Drive. The boobook owl also calls regularly. How I would also like to hear the sound of an Aboriginal corroboree. This excellent book is some consolation for this loss. 60 pages incl. 24 pages of photographs, illustrations and maps. Bibliography. This is a thematic regional historical archaeology. It documents Aboriginal camps and missions dating from 1870 to 1970, situated in the former Wiradjuri language region (central western NSW). Its new approach draws out correlations between written, oral and archaeological evidence. Fieldwork from the project is published as three books, each covering a different river area of NSW Murrumbidgee (Vol 1), Lachlan (Vol 2), and Macquarie (Vol 3). Extract of Robert Willson’s review in the Canberra Times, “Fragments of a heritage”: On the peaceful Murrumbidgee near Narrandera there are two places with names hinting at a bloody past. One is poisoned Waterholes Creek and the other is Massacre Island. The traditions of these places are recorded in the Murrumbidgee volume of Wiradjuri Places. In 1995 Ossie Ingram recalled an account given to him by an old man in the 1930s of what had happened there a century before. Near Buckingbong homestead several groups of Aboriginal families used to camp. The station owner poured drums of poison into a big waterhole called Green Swamp and many people died. Other families heard about this and cleared out to a place called Duck Bend. They camped on the island but a boundary rider spotted smoke from the kangaroo grass there and reported it to the boss. The station boss got the men together and they rode to the bend of the river where the island was, and they shot the whole group except for one man. The one survivor got a reed into his mouth and used it to breathe while he swam down the river with it. He bypassed all the places that he knew and finally collapsed at Benerembah station. The station owner’s daughter cared for him until he recovered, fell in love with him and married him. Too romantic to be believed? Strange things happened on the frontiers of settlement. Neville Lyons of Narrandera gives another version of the same tale about Poisoned Waterholes Creek. No contemporary record has come to light, but the Aboriginal oral tradition is very strong. In western NSW the 1830s was a period of frontier violence and Aboriginal resistance called “The Wiradjuri War”. Wiradjuri Places consists of three volumes which describe in vivid detail the surviving fragments of the Aboriginal heritage of the three great river basins of the area: Murrumbidgee, the Lachlan and the Macquarie. Dr Kabaila uses his skills to research and record the Aboriginal heritage of the vast Wiradjuri language region which includes much of inland central NSW. Personal recollections are contributed by a large number of members of the Aboriginal community. Emeritus Professor Isabel McBryde is the technical referee for the work. I was born in the centre of Wiradjuri country at Orange, and I have lived much of my life in the area. Yet these books record an Australian history, an Australian culture, that I scarcely knew existed. The author presents us with the published record of a massive fieldwork study in what was the forgotten history of Australia. Every known Aboriginal settlement in the area has been mapped and recorded, artefacts sketched, oral traditions preserved, and photographs identified. 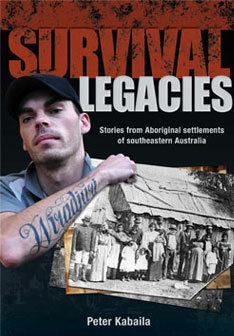 These books record a dark period in the Aboriginal history of NSW. Yet the record will be of inestimable value to future generations. A4 size incl. 75 pages of photos, illustrations and maps. A4 size incl. 62 pages of photos, illustrations and maps. A4 size incl. 51 pages of photos, illustrations and maps. These out of print publications have been incorporated into a Survival Legacies (see above). Contemporary Aborigines also tell their story of survival and change, from hunter-gatherers to urban people, in the staggeringly short time of a hundred and fifty years. The author combines evidence from a great variety of sources, never before combined, to reveal this lost history. He draws on rare unpublished maps and explorers’ accounts, and on the oral history of Aboriginal peoples. He records many of the routes taken by Aboriginal moth hunters, residents of Aboriginal missions, and Europeans up to the 1940s, and explains the contexts in which these movements took place. He also shows how the major roads and mountain passes of today grew from these early pathways. This story is supported by analysis of contemporary issues, quick reference maps, and an index that shows the history of today’s high country roads and towns. 186 pages incl. 70 photographs, maps, and illustrations.